I had a blast playing with felt & Katie Cupcake. One of the new releases from Little Paper Shop which you can find here. Click to download the 2 5/8 inch box here. I used dollar store felt from my Bam-Bam (aka Grandma) :O). It's great since the package has a variety of colours. It is on the thin side, but gluing it to cardstock fixes that! I found Alene's tack it over & over to be the perfect adhesive & stuck it under a pile of books overnight to dry nice & flat. The cardstock makes it really easy to cut & stitch the felt. Step 4) Emboss & colour an image. 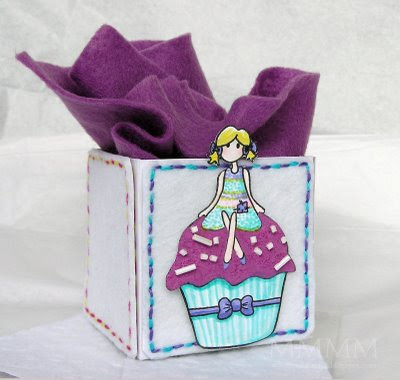 This Katie Cupcake has marvy Uchida puffy velvet pen (the purple icing) & Copic colouring. The sprinkles are beads glued on. May your day be an amazing one! Love the simple post hon! Good for you for doing one! :o) Love the cupcake box and the cupcake looks yum! Can't wait to see ya this Friday. Have a marvelous time on the Island! Hope you find some good craft treasures! My day is always amazing when I come by here and see the fabulous things your create. Well, I was going to say the same thing as Becky did - finding this box (and those instructions!) made my day amazing! As visiting always does! Thanks, Mel! Wow! That looks fabulous! Thank you so much for sharing this idea!